Baked kale chips are seasoned with Japanese furikake (rice seasoning) to create a healthful and flavorful Japanese-inspired snack. Traditional kale chips are seasoned with sea salt and olive oil, but in this Japanese version of the classic snack, salt is replaced with furikake, which is a Japanese seasoning mix of salt and other seasonings such as sesame seeds, dried seasoned seaweed (nori) flakes, and other dried ingredients. Wash and thoroughly drain curly leaf kale. Remove the curly kale leaves from the hard stem. Discard stems. Tear kale leaves into bite-sized or desired size. Spread out kale leaves on the parchment paper. Drizzle olive oil over the kale leaves and toss gently. Bake for 10 to 15 minutes, until the kale leaves are crisp and no longer soft. 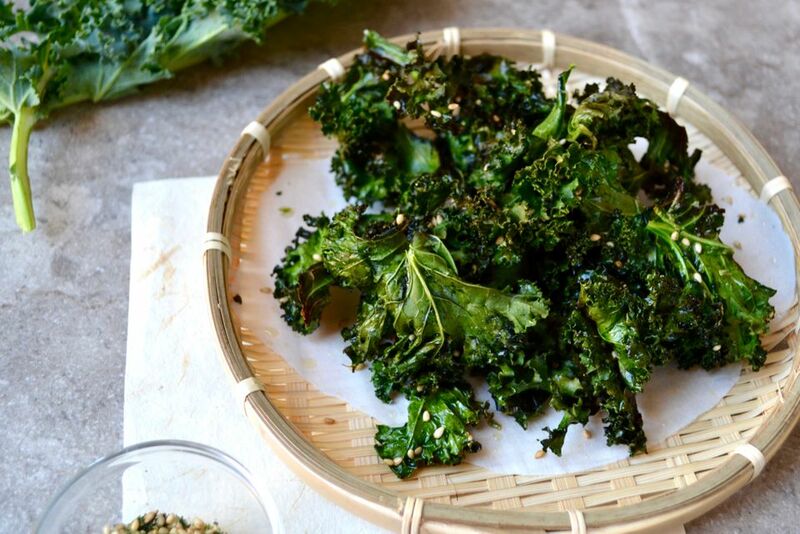 Remove from oven and immediately sprinkle kale chips with furikake (Japanese rice seasoning). Substitute vegetable flavored furikake (Japanese rice seasoning) with any flavor of furikake of your choice. Instead of olive oil, try herb or another flavor infused olive oil to make different flavor combinations. Don't crowd the baking sheet with kale, but instead give them enough space to crisp and for any moisture in the leaves to be baked off. It will ensure that each kale chip is crunchy and crisp. Although you might be tempted to salt the kale chips when you toss them with the olive oil, the furikake seasoning has plenty of salt to season the kale chips. Any extra salt and your chips may be too salty. If you're not familiar with Japanese cuisine, furikake is one of the most basic of rice seasonings that is made of dried ingredients, is shelf stable, and is a favorite among children. It is a condiment that makes a regular appearance during most Japanese meals by turning plain steamed rice into a colorful, flavorful dish of rice that you'll want to eat on its own. The number of furikake flavors available for sale at Japanese grocery stores is endless. However, popular Japanese furikake flavors include vegetable, egg, bonito fish (katsuo), cod roe (tarako), red perilla leaf (shiso), pickled plum (umeboshi), and seaweed (nori). For this kale chip recipe, I selected vegetable flavor, as I felt the dried vegetables would combine well with the natural flavor of the kale. By all means, try a variety of different furikake and see which you like the best. I can guarantee that almost any flavor of furikake will go well as a topping, or seasoning, for baked kale chips.